If your workplace decorations consist of a strand of garland and a few ornaments, you’re going to have to do better than that if you want to show up Amy Ryan. 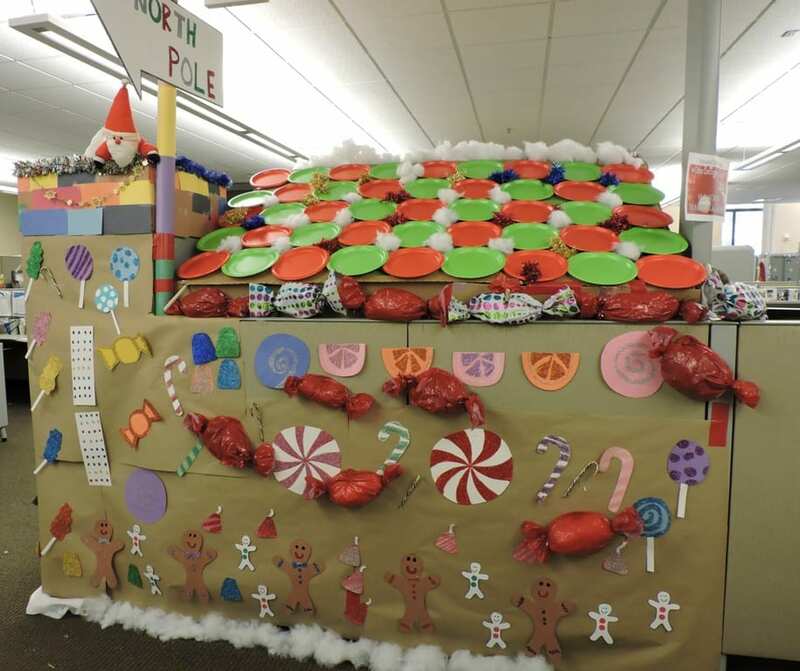 The 18-year Blue Cross Blue Shield of Michigan pricing employee has turned her cubicle into a fantastical gingerbread house. The spirited cube takeover comes complete with a hinged door and window for those times she needs to talk to her co-worker at the neighboring desk, Jamie Schram. Ryan and her co-workers in the statewide call-in pricing department recently competed in an office decorating contest. There’s a lot of holiday cheer displayed on the third floor of BCBSM’s Grand Rapids headquarters building on Monroe Center, but nothing comes close to Ryan’s head-turning, stop-you-in-your-tracks creation. For her creativity and execution, Ryan won a gift basket with candles, candy, and movie tickets. The house that Amy (and co-workers) built. Contest entries had to meet corporate decorating guidelines, which Ryan’s technically do. Security even measured to ensure her roof wasn’t too close to an exit sign and fire-suppressing sprinklers above her office. Amy Ryan’s gift-wrapped cubicle door, complete with bell and candy cane handle. The main house structure is made of cardboard. The roof is propped up with wooden dowels and secured with a lot of duct tape. Red and green paper plates and tinsel make for a charming thatched roof, while glittery, hand-decorated “candy” and gingerbread people adorn the sides of the house. Real candy canes were used for door and window handles. A single bell positioned at the top of Ryan’s remodeled cubicle door lets her know you need to see her as she works away in her festive cube. Pinterest was a big source of inspiration for the dazzling abode. Ryan started planning about six weeks prior to installation, sketching out the design. Decorations were completed about a week before everything went up and a fortuitous supply of cardboard was secured from a television installation technician who’d been doing some work in the building.Co-workers Ronda Mrozik, Rebecca Schofield, Ryan Wilson, Jim Atchinson, and next-door neighbor Schram helped Ryan’s plan come to life. A window allows Amy Ryan and desk neighbor Jamie Schram keep the conversation flowing. While she doesn’t decorate her cube every year and says this is definitely her biggest display ever, Ryan thinks having fun in the workplace is important. Think your office decorations top Ryan’s? Tell us all about it in the comments and show us your photographic evidence. Durning all the HCR changes -bravo to the team leads for allowing their employees to be creative!! Everyone needs to blow off steam and this is simply amazing what Amy has come up with- its nice to see enjoyment in the work place- thank you BCBSM for letting us shine! I absolutely love it! I’m downtown and I wish I was there to witness it myself. I’m sure the pictures don’t do her Gingerbread House justice. Awesome!! As the picture taker, I’ll readily admit that the pictures don’t do it justice at all! It’s fabulous!! Amy, your Gingerbread house was absolutley AWESOME!!! Loved it and I second Tina’s sentiment, It is so refresing to see employees allowed to have a little bit of fun at work and spread Holiday joy!! !